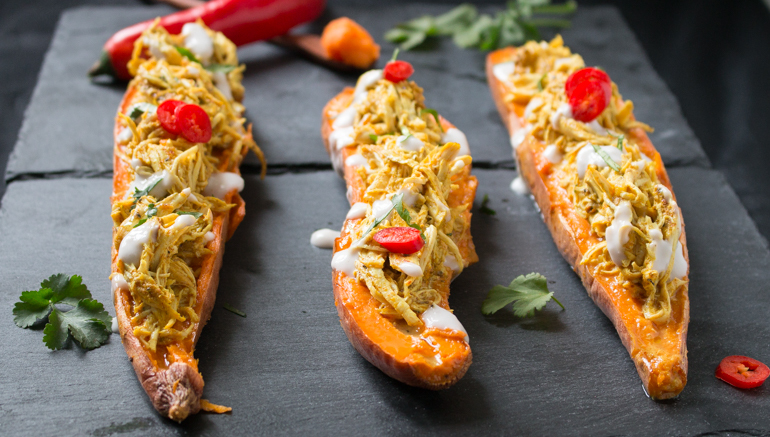 Pull Apart Chicken Tandoori Sweet Potato Skins are made with mouth-watering slow cooked stove top chicken with a blend of Indian spices cooked until pull apart tender and then piled high in a delicious sweet potato skin. Lightly Spicy! Naturally Sweet! A delicious treat! 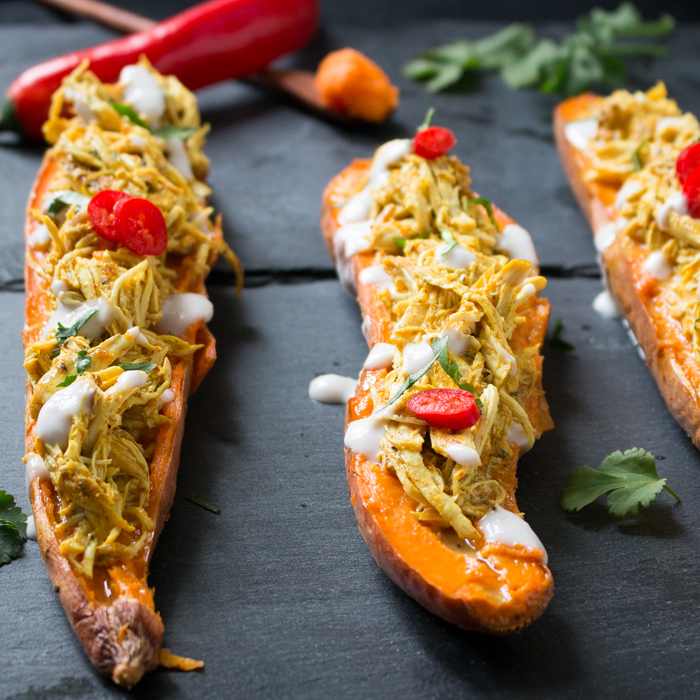 You are going to love this little creative Pull Apart Chicken Tandoori Sweet Potato Skins dish as it satisfies all of the usual palate needs. 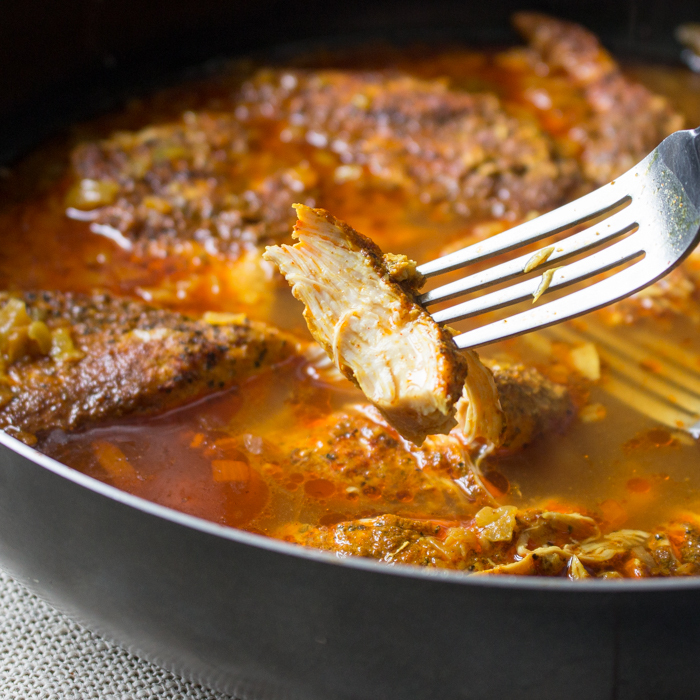 Your spice craving is satiated with a little spicy and warmth from the chili, turmeric, cumin and paprika. Your sweet tooth is going to be super happy from the natural sweetness of the sweet potato skins and your body is going to love you as it is dairy-free, gluten-free and paleo friendly. 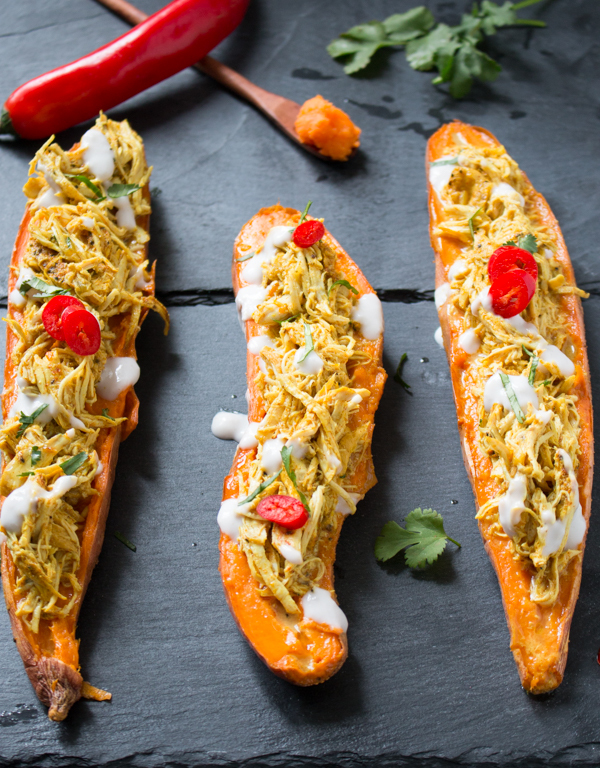 Who needs bread anyways with these delicious little Pull Apart Chicken Tandoori sweet potato skins. Gluten and me are not best of friends and nor are those nasty loaves of pre-made gluten bread (bag of rocks) that are available at the grocery store. If I wanted to eat cardboard, then I would just buy cardboard and eat it. Now don't you worry, you are not going to miss slices of that cardboard gluten-free bread one bit with these delicious sweet potato skins. If you want an easy and delicious gluten-free bread, try my Gluten-Free Herbes De Provence Buns instead. Do some of you remember my post for Stove Top Chicken Fajitas Sliders? This Pull Apart Chicken Tandoori Sweet Potato Skins builds on top of that same concept of slow stove top cooking. See this just works out perfect as just for the same amount of time it takes to bake your sweet potatoes it takes for your chicken to get delicious tender. 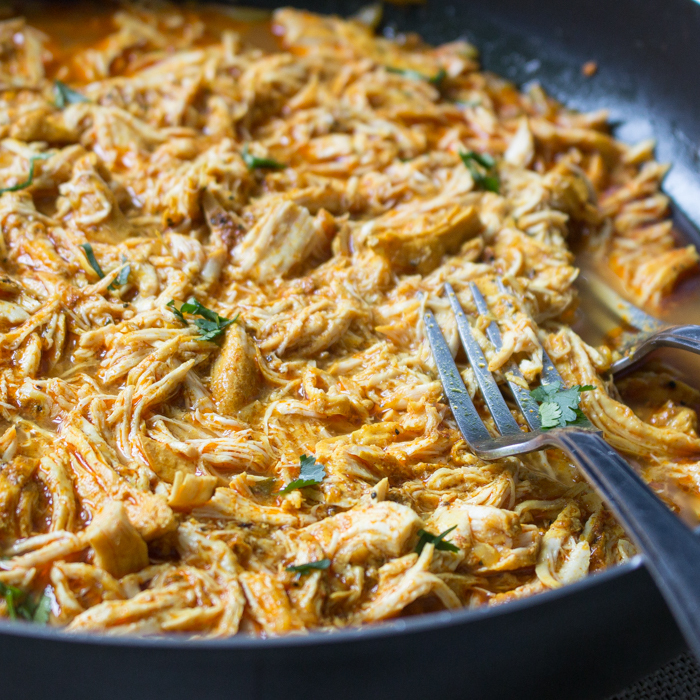 My boys love the delicious stove-top pull apart Tandoori chicken in a delicious flat bread and the chicken is even better the next day. On a work day, if you throw all the ingredients in a slow cooker, you could come home to one delicious hot Pull Apart Chicken Tandoori. 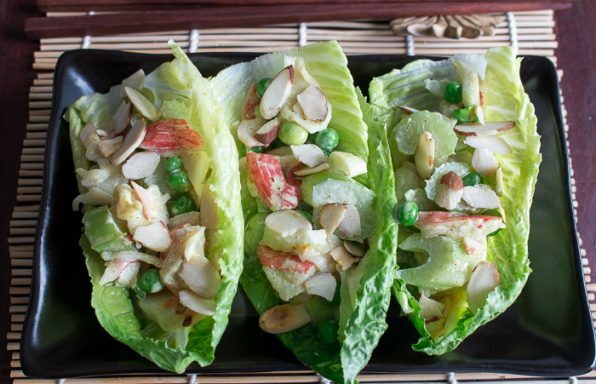 If I was using a slow cooker for the chicken, I might hold off on putting the dairy free coconut plain yogurt in until you came home and then finish off the dish. It is in between season here in Hong Kong. 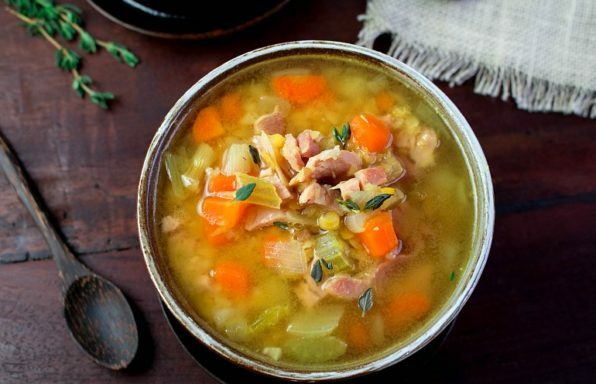 Yesterday it was 20 degrees C and today it is only 10 degrees C so you really need to take care and nourish your body. Turmeric, cumin, chili and paprika are all warming spices when it is cold and damp outside you need to be warmed from the inside out. Turmeric is frequently used in Traditional Chinese Medicine to treat migrating aches and inflammation that is made worse by the cold and damp weather. I think I need a double dose for sure. 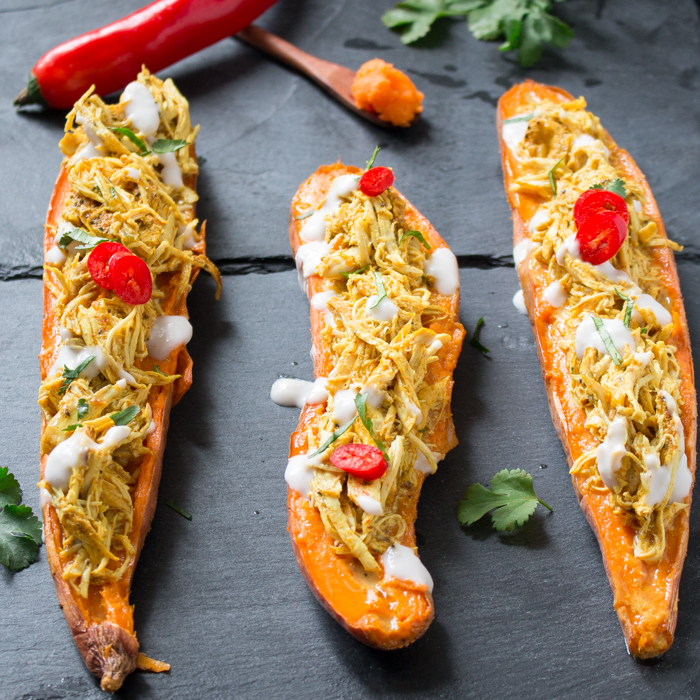 Pull Apart Chicken Tandoori Sweet Potato Skins are a delicious main course for family or friends as you can make everything in advance and just assemble when you are ready to eat. You are going to want to make a little extra of the pull apart chicken, as it is even better the next day. 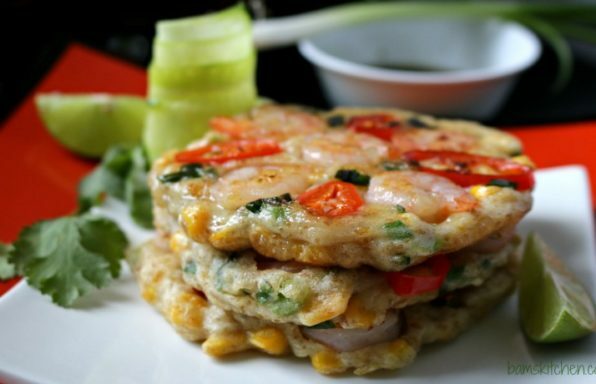 Are you looking for other inspiring dishes to make with chicken? Please follow along on our CHICKEN A BIZILLION WAYS Pinterest board and I am sure you will find something to make your taste buds happy. 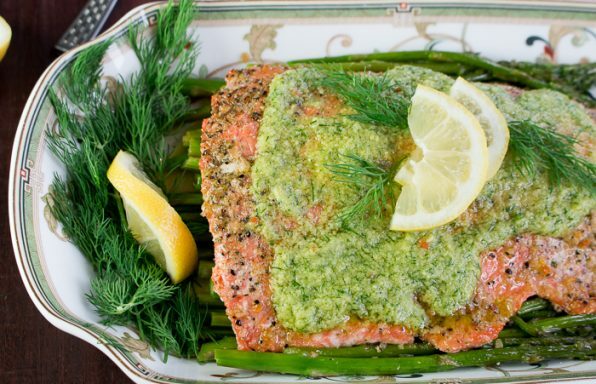 1Preheat oven to 190 degrees C (375 degrees F). 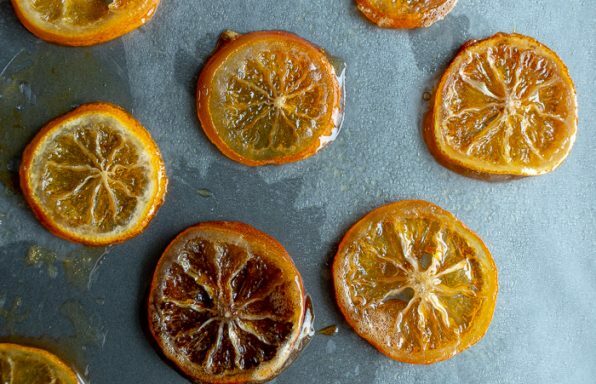 2Bake your Sweet Potatoes. Place your whole sweet potatoes on a lined baking tray. Rub your whole sweet potatoes with coconut oil or oil of choice. 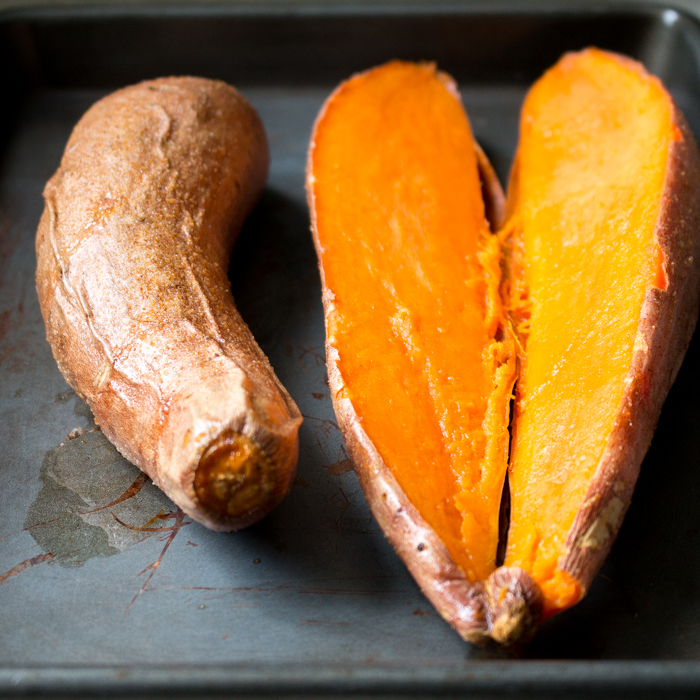 Bake your whole sweet potatoes for about 45 minute to 1 hour or until you can easily pierce your fork or knife into the middle without resistance. Remove from oven, keep warm and set aside. 3In the time while your sweet potatoes are baking, Cook your chicken tandoori. 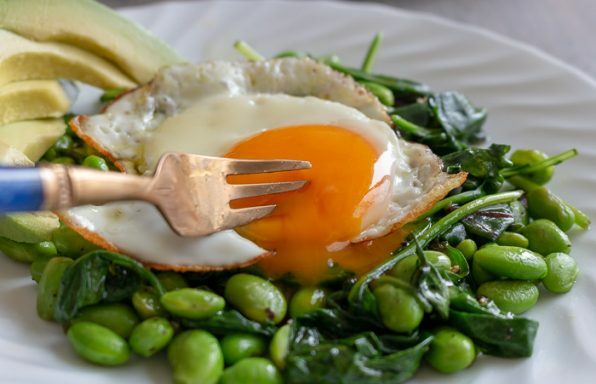 Place your oil of choice in a large frying pan, add you onions and garlic and sauté until translucent on medium heat. sprinkle your turmeric, cumin, paprika and salt and pepper on both sides of your clean and dry boneless and skinless chicken breasts. Add your chicken breasts to the pan and cook on each side for just about 2 minutes to seal in the juices. Then turn your heat down to a simmer and add your gluten free chicken broth and put a lid. Simmer your tandoori chicken slowly on the stove top for about 50 minutes to one hour or when the chicken easily pulls apart with a fork. 4Pull chicken apart with 2 forks and add the plain (coconut) low fat yogurt and mix well. 5Assembly. Cut your sweet potatoes in half and scoop out just a little bit of the sweet potato so you can pile a few scoops of your delicious tandoori chicken. Drizzle a little of the plain (coconut) low fat yogurt on top and cilantro and enjoy.